I don’t think weekend breakfasts get much better than a batch of warm homemade scones alongside a nice hot cup of tea or coffee. I found a fantastic scone recipe in Joan Hassol’s Well Preserved recently, and it’s the perfect way to use up the buttermilk that I have left over from my recent batch of butter. As with most recipes, I changed it a little bit to suit our tastes and to work with what I had on hand, but the basic recipe is pretty much the same. I omitted the crystalized ginger and added some chopped nuts and a pinch of nutmeg, as well as a hint of sugary crunch on top. Preheat oven to 400 degrees. Whisk first three ingredients together in a small bowl; set aside. Stir together the sugar, flour, salt, baking powder and baking soda. Using your hands (or a food processor), rub the butter into the dry ingredients until uniform and resembles cornmeal. Stir in the fruit, nuts, and nutmeg. Add wet ingredients, and mix with a fork just until combined. Pour out onto well floured surface and knead together just for a few seconds (do not overwork). Pat into either two 6 inch rounds (for 12 small scones) or one 8 inch round (for 8 large scones). Cut rounds into triangles and place on greased baking sheet. If desired, brush tops with a little more buttermilk or milk, and sprinkle with sugar (turbinado is nice). Bake 12-15 minutes, or until golden.These freshen up nicely the next day by placing them in a warm oven (250 degrees or so) for about 10 minutes. Thanks for the recipe – yum. 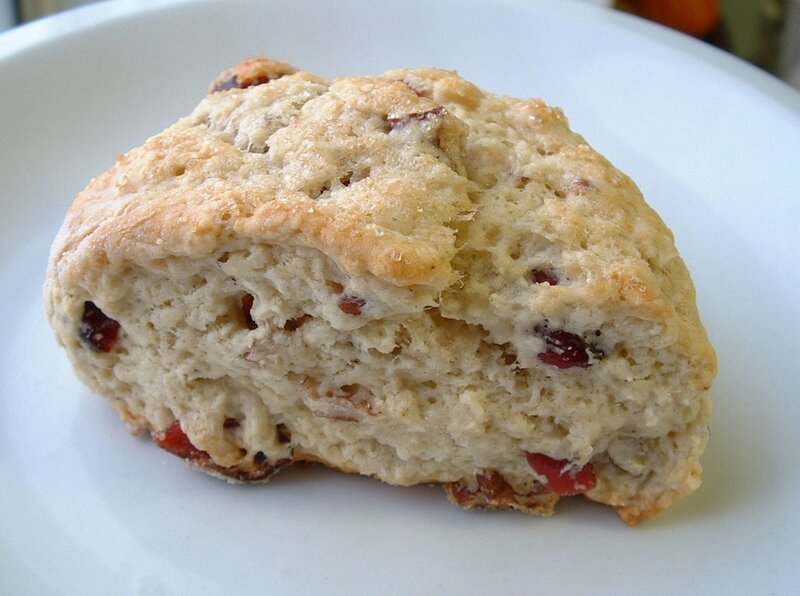 I also have a fave scone recipe. One I found in “Fine Cooking”. It is made with orange zest and currants. It is easy and quick and even impressive for weekend guests for breakfast. I will also try yours next time scones are on the menu!